Unseen Forces, an expansion for Elder Sign, brings a fresh challenge to the efforts of the investigators in this cooperative dice game set in the world of H.P. Lovecraft’s weird fiction. The museum harbors artifacts that draw the attention of horrible beings, and the unfathomable wills of these creatures make themselves known in the form of blessings and curses. New Ancient Ones, monsters, and investigators accompany the introduction of these powers, and the entrance of the museum has been remodeled, adding new locations and options for the beleaguered investigators. The entrance to the museum has undergone an overhaul, and Unseen Forces introduces four Entrance Cards in place of the Entrance Reference Sheet. 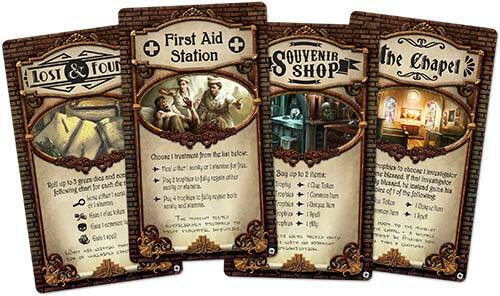 The new Entrance options give investigators more ways to spend their turn if they’d rather not attempt an adventure. The spaces at the entrance are the Chapel, the Lost and Found, the Souvenir Shop, and the First Aid Station. Blessings and curses abound, the entrance has undergone remodeling, and the threats to be faced have increased in difficulty. Do you have what it takes to brave Unseen Forces and survive with your brain and body intact? Since this is a first review for this game on the site I went into a fair bit of detail. It presumes familiarity with the base Elder Sign. Elder Sign: Unseen Forces was released two years after the original tale of using awesome green dice to seal away Ancient Ones in a creepy old museums. All in all it is a fairly unobtrusive expansion that enhances the game gently as opposed to reinventing it. It adds variety in terms of adventures and effects that take place during the game, offers new characters and enemies of varying interest, successfully fiddles with the purchasing mechanic and most importantly – adds a new mechanic with more custom dice. Let’s be honest here, it was all about the dice to begin with, so having the black and white added to the standard set of green, yellow and red is very exciting. 1. Cursed/Blessed Mechanic . New effects (either through success/failures in adventures, Mythos cards or item use) can impart on characters the state of being Cursed or Blessed. If you are blessed – you add a white die to each one of your rolls – it acts as an extra green die in all respects. It is a very powerful power-up as it gives you one more powerful reroll and more dice to score the results you need. Being cursed on the other hand adds a black die that negates one other die roll with the same result, thus effectively reducing your dice pool. The effects cancel each other out, so if a cursed investigator becomes blessed – the curse goes away. Curses appear as “punishment” for many of the new tasks and monsters, while Blessings can be obtained through some of the new item cards or purchased at the Chapel for 8 trophies. The balance here shifts a bit towards the white die as there are more opportunities to become blessed and it provides a more constant benefit. Becoming blessed early greatly improves your chances of long-term success, although it’s wise to remember that the blessing goes away if you fail an adventure. 2. New Ancient Ones. There are four of them and they are wonderful. Not only are they tougher than the average baddie from the original box, some of them bring in interesting new effects, like The Eater of Worlds who makes every failed adventure disappear and not be replaced, limiting your options with each setback and winning if the entire board is consumed. Abhoth, master of monsters spawns a new tough monster each turn and the game is lost if the players allow all three of them to exist on the same midnight, so it really forces some tough decisions and risk-taking. 3. New Adventurers, Allies, Items and Spells : There are eight new adventurers in total and while some of these feel interesting and powerful (like the Crocodile Dundee look-alike who can turn a yellow die into any result) – others fall short (Gaining one extra trophy per adventure is just not all that exciting). Some have interesting but limiting powers like getting a clue every time you defeat a monster. Additions here are uneven and just ok. Same can be said for the additional spells, items and artifacts. The three new allies are interesting and make you want to invest into getting them. 4. New Adventure and Other World Cards : Importantly, some of the old cards have been reprinted and replace existing ones, fixing previous errors. New additions do not provide too much excitement as it’s mostly more of the same, adding effects to bring the new cursed/blessed mechanic into play. Some of the new cards, like “The Visiting Antiquarian” that locks up both your red and yellow dice are pretty brutal. Overall these additions offer some variety without rocking the boat. 5. New purchasing rules : Fantasy Flight Games have made an important decision to ban Elder Sign purchase for trophies (as that led to some anticlimactic game finales). Furthermore, the “Entrance” card was broken up into four distinct locations – an Infirmary for healing up, Chapel for blessings, Souvenir Shop for purchasing items, spells and allies and Lost&Found for trying to get something for free. The number of purchases in Souvenir Shop has been increased to two. In addition with ability to pay to get blessed – this raises the relevance of trophies making the in-game currency useful. Certain effects can now also “close up” any of the shops, limiting characters’ ability to heal for the remainder of the adventure. This is a neat twist that adds tension. 6. New Mythos Cards: These are used to up the difficulty of the game as the new ones are much more likely to bring in monsters or Doom Tokens into play. For players looking for a real challenge, there are nine additional “Master” mythos cards with truly terrible effects (e.g. spawning four monsters at once) that really up the difficulty. New mythos cards is a strong addition to the game. In conclusion: Unseen Forces expansion does not revolutionize the gameplay of Elder Sign, but brings a welcome increase in difficulty and variability that is enjoyable for the most part. The most notable change – the curse/blessing mechanic adds to the game nicely, providing additional depth and options without overcomplicating things. While it is an enjoyable expansion that definitely makes the game better it left me feeling that more daring steps could be taken for higher payoff. Both in terms of deviation from the original and increasing the difficulty – more would be welcome. As it stands – it will not convert any of those who were not fans of the original but will provide enjoyable additional content to the fans of the base game. Much like the original, Elder Sign: Unseen Forces is a co-op game for 1-8 players (wait times become quite tedious with 5+) that plays within roughly 1.5 hours. Suggested for fans of light gameplay, custom dice and Cthulhu mythos. Heavy emphasis on luck, cooperative nature of the game and inability to strategize much might turn other boardgamers away. Add a Review for "Elder Sign: Unseen Forces"